The 10th by-election is over at Hulu Selangor and it is most unfortunate that we suffered a setback amidst the hundreds of millions of ringgit poured in by the BN government. Nevertheless, our struggle for a Malaysian's Malaysia is now shifted to Sibu Sarawak and we at DAP will lead the challenge. We expect the BN in Sarawak will pour even more resources into maintaining their grip in this by-election. Despite that we at DAP still believe we can make a difference and a clear statement that Malaysians from both East and West want and deserve a change. The diverse landscape makes effort to reach out tothe voters even more challenging. We ask you to consider donating RM500 or more for this effort including asking your friends and relatives who believe in our good cause to do likewise. Your love for the nation will definitely make a difference. I read with grave concern on the news of a teen shot dead by police in Shah Alam in the early hours of last Monday. Whether there is any wrongdoings on the police or it is a genuine police case, the police and the Federal Government ought to come clear, open and transparent on the saddening incident. There should be no delay in establishing IPCMC to probe all cases of power abuse and police brutality of the force itself. "People First,Performance Now" should be honoured with true actions. I wonder how long non-UMNO component parties in BN can tolerate UMNO any longer. In an inaugural BN Selangor convention held in Shah Alam, UMNO, the dominant parties in BN arrange their leaders only to sit on the stage and address the convention. 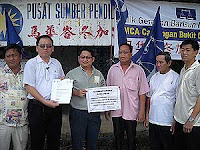 Though representatives and senior leaders from MCA, MIC, PPP and Gerakan are invited to the stage later when PM arrived in the afternoon, representatives from MCA Kapar could not stay any longer and leave the convention when Tanjong Karang MP, Noh Omar said that non-Malays should be grateful that they were granted Malaysian citizenship. Is Noh Omar in the spirit of 1Malaysia? Not even MCA, MIC, PPP and Gerakan are not invited to sit on the stage and to address the convention, their senior leaders were asked to sit together with the crowds. Is this how UMNO respect their friends in BN? And about the speakers...Utusan Malaysia Chief Editor Zaini Hassan and Chinese Muslim scholars Riduan Tee Abdullah spoke and presented their views and findings. They are connected to UMNO or UMNO-linked circle. Why MCA, MIC, Gerakan and PPP-linked scholars and thinkers are not invited? Why was the whole convention dominated by UMNO? 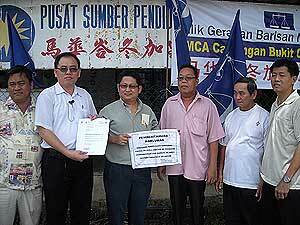 Why MCA, MIC, Gerakan and PPP are ot invited to participate in organizing the event? I had the privilege of being involved in two PR conventions. First, the national PR convention and second, the Selangor PR convention, held not so long ago. All component parties in PR were involved. Not one party was sidelined. How could MCA, MIC, Gerakan and PPP's grassroot hold their heads high when their leaders are not respected by UMNO? How could MCA, MIC, Gerakan and PPP expect to win back Selangor when their leaders are not respected at all? It is the right time to STOP BN taking over from taking over Selangor.